I’m publishing this recipe at the request of my friend Paula W. We had a dinner date this week and I realized I’d been doing a lot of cooking and had a refrigerator full of recipe tests in need of a taster (beside myself). I’m happy to report that they were all delicious! This particular dish was Paula’s favorite and she has already called me for the recipe…so Paula, here it is. Hope you love it too. Enjoy! Although I originally make this without the currants, I find I like the addition; Paula thought it might be one flavor too many. Preheat oven to 400°F. Cut the eggplant in half lengthwise. Scoop out the center leaving about 1/2 inch of the flesh in the shell. 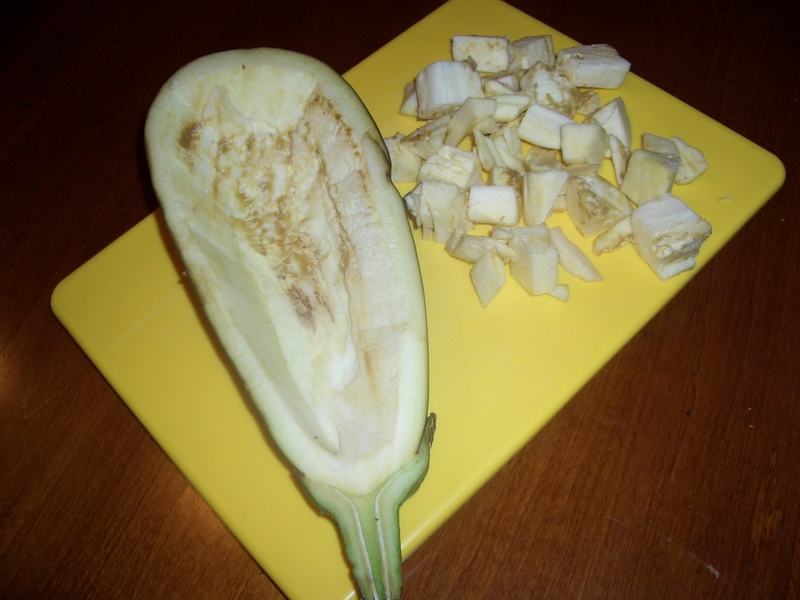 Coarsely chop the eggplant you removed from the shell. 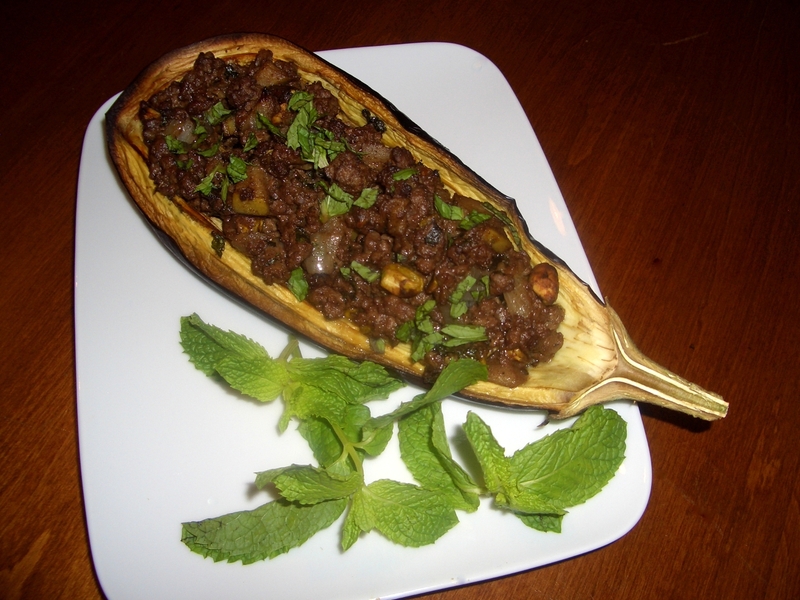 Place the eggplant shells and chopped eggplant on a jelly roll pan lined with greased aluminum foil. Spray the eggplant with olive oil (you already own a Misto, right?). 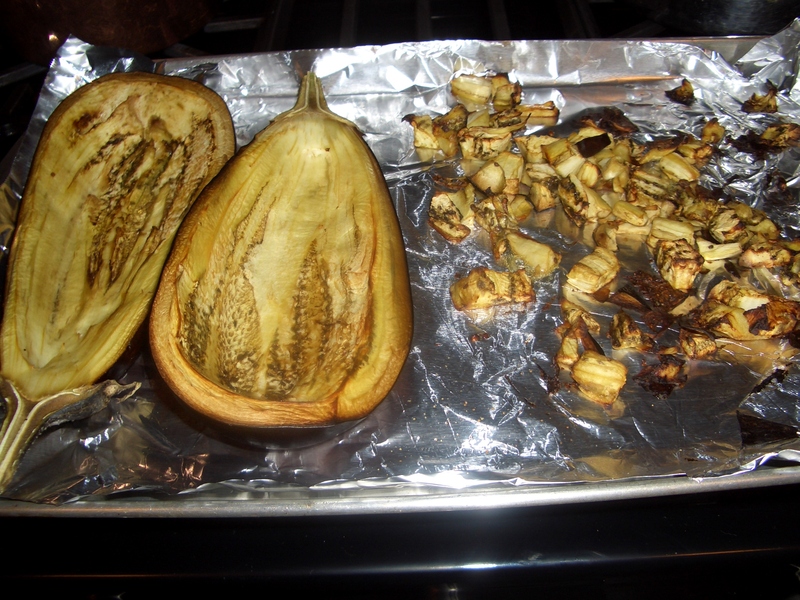 Bake for 30 minutes until the eggplant is nicely browned, stirring once. 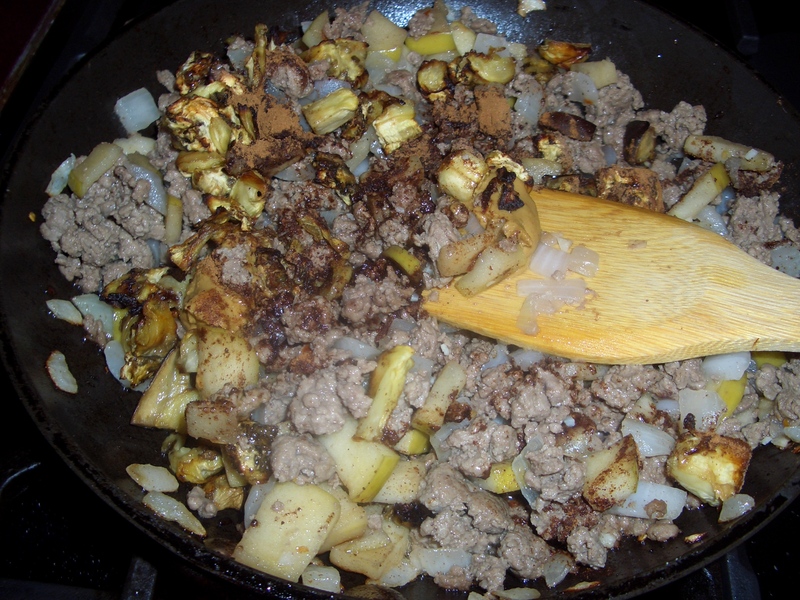 In a large skillet, combine the lamb, onions, apple, garlic and red pepper. Cook stirring until the lamb is broken up and browned. Stir in the cinnamon and allspice until absorbed. Stir in the juice, nut butter, and vinegar. Cook, stirring, until liquids evaporate. 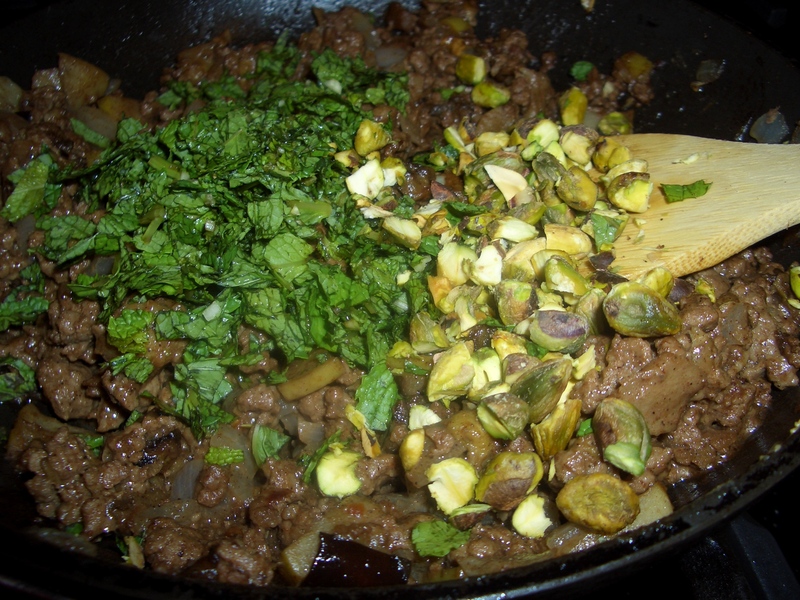 Stir in the mint, pistachios, and currants (if using). Cook, stirring, 3 to 4 minutes or until everything is heated through. 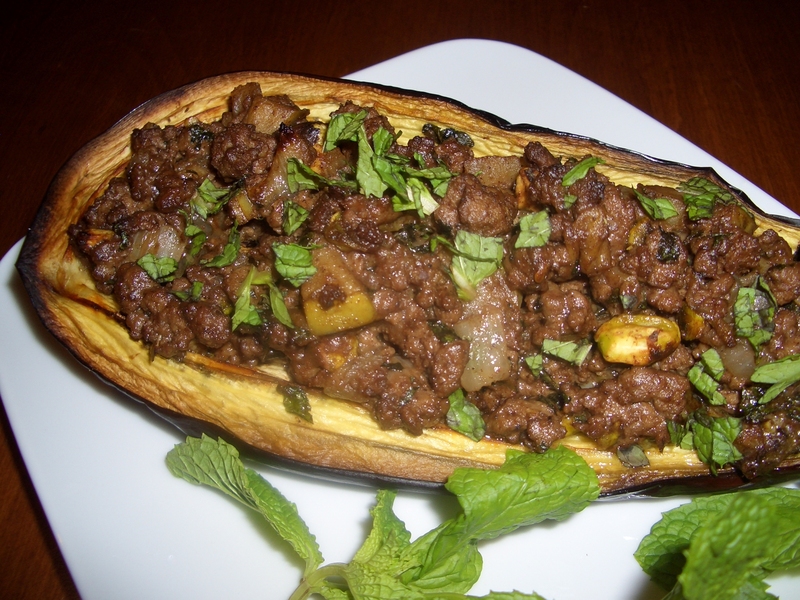 Place half of the lamb mixture into each of the eggplant halves. Return to oven and bake 10 to 15 minutes or until everything is warm.